In the wake of Ayyamul Barakatil Khuldiyya and the Janaza of our beloved Syedna Khuzaima Qutbuddin at the beginning of Rajab, we present this unique Nazaraat article. Syedna Burhanuddin asked Syedna Qutbuddin to accompany him in the car in which he took the Janaza Mubaraka of Syedna Taher Saifuddin from Matheran to Saify Mahal. Syedna Burhanuddin consulted Syedna Qutbuddin where he thought Syedna Taher Saifuddin should be buried. Syedna Qutbuddin did araz to Burhanuddin Maula that he consider the mubarak place of Qasr-e-Husaini for burial, which today is Rozat Tahera. When Syedna Burhanuddin opened the kafan mubarak to see Syedna Taher Saifuddin’s noorani face for the very last time, he summoned only Syedna Qutbuddin to attain this most high honor with him. As per the amal of Duat Mutlaqeen, Syedna Burhanuddin walked behind the Janaza of Syedna Taher Saifuddin as it was carried on the shoulders of hundreds of thousands of Mumineen from Saify Mahal to Saify Masjid. Burhanuddin Maula tasked Qutbuddin Maula to oversee the arrangements. Near Chowpatty, the crowd of Mumineen became virtually uncontrollable and the police, out of fear, unilaterally decided to put the Janaza in a car. At that moment, Qutbuddin Maula stopped them with the niyyat that as many Mumineen as possible should attain their most fervent desire of giving shoulder to the Janaza. Amidst the chaos, he organized the police officers into a ring formation around the Janaza, by which they regained control, and were then able to systematically let in Mumineen for attaining this most holy sharaf. 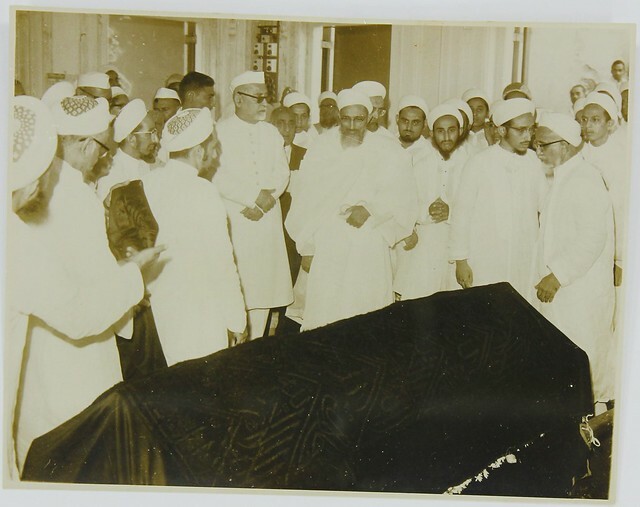 We are also presenting some unique photographs from Syedna Taher Saifuddin’s janaza. In one of the photos presented here the parda of baitullah which was draped over Syedna Taher Saifuddin’s Janaza is visible. Just the night before Syedna Qutbuddin’s dafan, divine providence (inayat ilahiyah) provided from Syedna Qutbuddin’s khazanah the most appropriate cloth to drape over the kafan – the very same piece of cloth formerly draped over the Kabatullah which was used to drape the janaza mubaraka of Syedna Taher Saifuddin. May Allah give Afzal-ul-Jaza to his Dais, Syedna Taher Saifuddin and Syedna Mohammed Burhanuddin and Syedna Khuzaima Qutbuddin. May their nazaraat from a’la illiyeen continue to flow towards their waaris Syedna Taher Fakhruddin TUS, and from him towards all Mumineen, Muminaat and their children. Ameen.